SPARK Connect: Rewind & Forecast is an AVGC industry get together hosted by AnimationXpress. We look to converge this ecosystem to delve into the major happenings of the year gone by and SWOT analysis of the year to come. 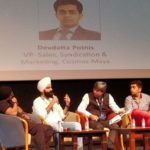 A conference was hosted in Mumbai with key notes, panel discussions and industry get together to share dialogues upon 2017- the year that was and 2018- what to look forward to.